Do you have a burning challenge in your organization? Do you have any of the following urgent business turnaround or business process re-engineering needs? If any of the above are causing you or your customers to lose sleep and you are ready to break through and achieve business process re-engineering and business turnaround optimization, you can count on our Optimal Thinking SWAT Team for the highest quality optimization analysis and evidence-based solutions. 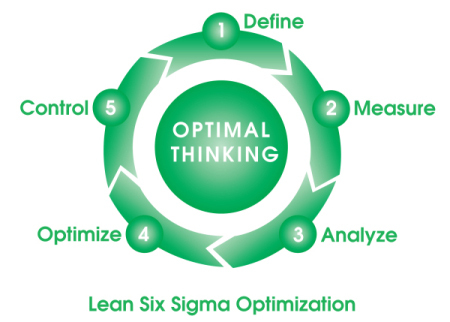 Lean Six Sigma (LSS) is a structured team approach for listening to customers and improving resources and processes to ensure the customers’ expectations are satisfied. It focuses on the elimination of waste and the reduction of variability in providing product or service to the customer. Decision-making is based on facts and data while results are monitored with key performance metrics to ensure success. In our proprietary evidence-based Continuous Enterprise Optimization (CEO) approach, Optimal Thinking ensures the optimization of every activity. The measurable results achieved with Continuous Enterprise Optimization tools and techniques are optimized and sustained, and suboptimal consequences are avoided. Optimization is the fundamental standard. Whether you are in a start up business, mid-sized organization, non-profit organization, multinational company or in the public sector, you will receive a practical, supremely crafted business turnaround solution specifically targeted to your needs. We even provide “alignment workshops” that ask middle managers — the people who make processes work — to outline how your organization’s systems could inhibit agendas for change and their best practices for optimum result. Our business turnaround optimization consultants are fluent in nine languages. With 70 years of combined experience, and clients including the U.S. Treasury, National Australia Bank, Raytheon Systems Company, Hughes Aircraft Company, Johnson & Johnson, Air New Zealand, Delco Electronics Corporation, Golden West Homes, BP, and the U.S. Army, you can be certain that your business interests are in the hands of a trustworthy, reliable company. Employing Optimal Thinking, we will ask the most incisive questions to determine your unique business turnaround challenges and collaborate with you to develop, optimize and execute your best options on time and on budget. As we are totally confident in our ability to optimize your business turnaround, we offer a 30-day money back guarantee. If you are ready for immediate implementation, we will collaborate with you to customize your optimal path. Your burning challenge(s) will be best resolved in one or more of the following areas.